It was a warm afternoon. A large crowd gathered in front of the Midan Theatre, outside the Hanager Arts Centre. Young people from many walks of life flocked to the Opera House grounds to attend the Bollywood dance workshop, the first event of India by the Nile. Hundreds of enthusiastic attendees chitchatted on the lawns and the opendoors area in front of the Hanager; everyone seemed excited and anxious, waiting for the dance instructor Gilles Chuyen, the India-based French choreographer, to take the stage and lead the crowd through the simple moves where basic footsteps and hand gestures were spiced up with hip sways. In its third edition, which kicked off on 30 March (and continues until 16 April), the India by the Nile festival continues to enchant Egyptian audiences with a photogenic radiance unique to India. Back in 2013, Azar A. H. Khan, the former director of the Maulana Azad Centre, put it well: “Egyptians are very receptive to Indian culture.” It goes without saying that a festival such as India by the Nile can only benefit from, invest in and additionally boost this tendency. Indian culture of course remains equally attractive to countless worldwide spectators who find themselves caught in the spell of one or another of its multiple layers. Nine distinctive classical dance traditions, thousands of years of music and architecture, scores of painting and sculpture schools, crafts, inimitable cuisine and spiritual teachings must have something for everyone. India is after all a country with population of 1.3 billion, 20 official languages and over 120 others in active use, in addition to dozens of customs and many religions. All this forms a reservoir of stunning wealth. But while there is so much to choose from, the majority of India’s fans turn their eye to the Bollywood Empire, comprising over 1,000 films from Mumbai, a city filled with superstars, music and dance. This year, the India by the Nile organisers capitalised on Egypt’s seemingly inexhaustible thirst for Bollywood. 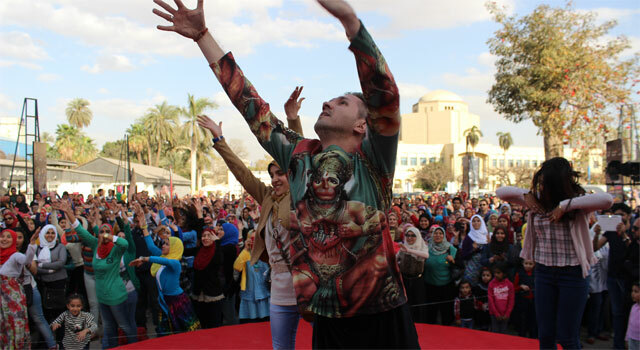 Bollywood stepped into Cairo with a dance flash mob at Cairo Airport, followed by workshops with Chuyen, screenings of Indian movies and a visit by the megastar Amitabh Bachchan. On that first afternoon at the Midan Theatre, many cheerful attendees came wearing colourful scarves and skirts, demonstrating their own understanding of Indian traditional clothing. Some even marked their foreheads with a bindi. All roared, moving frantically towards Chuyen, disregarding the fact that crowding would hamper their dance movements. It took Chuyen several minutes to convince the exuberant attendees to create spaces between one another. In the midst of this highly frenzied atmosphere, the choreographer began by addressing the workshop participants; soon, however, he turned his face and body towards the rows of journalists and photographers packed upstage, most of the time giving his back to the audience. Surprisingly no one seemed bothered by the event’s setup or Chuyen’s back. Worshipping Bollywood unconditionally, everyone just repeated the moves. This was only the beginning of the Bollywood frenzy that took control of the Egyptian audiences for a few consecutive days. 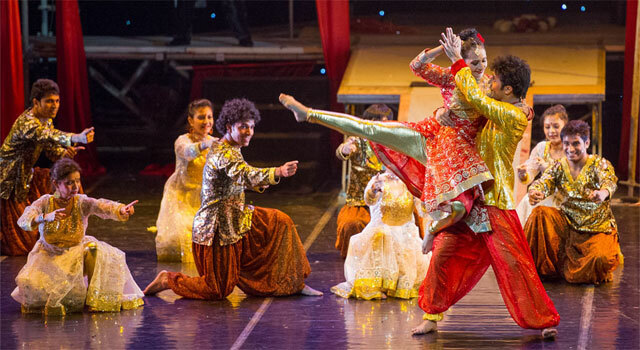 India by the Nile’s regular show this year, directed by Sanjoy Roy, with Chuyen’s choreography, carried a fiery title, Bollywood Extravaganza: A Tale of Passion, Love and Revenge, which lured the audiences of Cairo and Alexandria. Once again, hundreds of attendees flocked to the Cairo Opera House, where they were rewarded with a vibrant and loud, almost deafening, extravaganza of colours, costumes, singing and dance. Two visits to the Cairo Opera were enough to understand how the attendees craved and enjoyed the shows. Providing sheer entertainment to some and a mind-numbing sensation to others, the show remained without artistic depth or intellectual stimulation. Law’s notes are in a way a simplified adaptation of French philosopher Guy Debord’s much heavier and deeper The Society of the Spectacle, a precursor of the Situationalist International movement. In this 1960s work, Debord discusses the concept of a spectacle in its wider economic and socio-political contexts, reaching the conclusion that the decline of modern society results from its direct dependence on mere representations (the core component of any political, ideological or cultural spectacle). Debord warned against biopolitics and the growing totalitarian enslavement of minds, a phenomenon that has metastised across all life’s sectors. The perceptible world is “replaced by a set of images that are superior to that world yet at the same time impose themselves as eminently perceptible,” Debord argues. But whatever your view of Debord, whose ideas remain highly contrversial, one fact remains: when he published The Society of the Spectacle back in 1967, he could not have known that, almost half a century later, many of his claims would remain applicable to understanding the phenomena of Bollywood, or Hollywood for that matter, as a case of a “spectacle” successfully manipulating a consumerist society. Perhaps, the growing consumerist nature of Egyptian society, along with social turmoil and uncertainties, is one way to understand the fascination of millions who live on a Nile valley with Bollywood. This might explain why hundreds followed, almost in a state of trance, the choreographer’s Indian moves on the Opera grounds. Those Egyptians, who look mesmerized watching Bollywood films, seem to be submerging their souls into the Indian pseudo-­culture which reflects their dreams, lovers and heroes. At any Cairo or Alexandria movie theatre, the minds of millions who struggle daily with issues such as poverty, social injustice and unfulfilled dreams, seem to be soothed, their emotions pampered, while the global mechanism of “the spectacle” watches in satisfaction. The legendary actor Amitabh Bachchan has indeed drawn a number of parallels between the attributes and “common emotions” that characterise the Egyptian and Indian mindset, making the people of Egypt particularly responsive to Bollywood. “Many Bollywood movies talk about simple people and how they grow to prominence, how they succeed in social circles or country, how they manage to challenge the establishments,” he explained. Cultural festivals often incorporate spectacles, and India by the Nile uses Bollywood to generate interest in its many other components: the size of the audience at literary discussions and classical dance performances testifies to the success of this strategy. Last year I had the opportunity to interview, the festival director Sanjoy Roy, who also heads Teamwork Arts, the company that organises India by the Nile and dozens of other festivals in India and internationally. Roy revealed that the secret of a successful festival lies in the organisers’ ability to make the whole experience worthwhile. It’s not about singular events but “this particular experience, colours, people, crowd, intellectual discourse – all this makes the whole journey unique”. Commenting on last year’s Bollywood show, Roy said, ”The sellers, the wedding procession, music, interaction between the storyteller and the audience, people buzzing around… It’s not a stage show only but an experience. 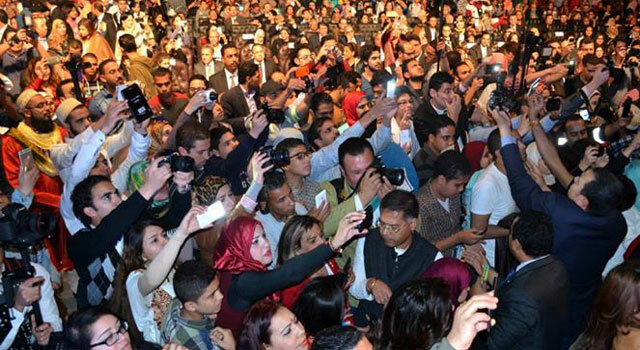 Maybe it’s a stage show by accident.” Faithful to his mission, and capitalising on Egyptians’ particular “receptiveness”, Roy once again applied his theory, and the result is an unprecedented number of attendees. Among those it is interesting to note that there are established groups of young Bollywood aficionados who practice the dance on a regular basis. A hybrid of traditional Indian folk dances such as Kathak and Bharatanatyam and Western forms, the Bollywood dance has been increasingly overshadowed by jazz, hip-hop, even Oriental or as we saw in the Extravaganza Latin dance elements. Bollywood is not afraid of any mixture. It is ready to reach out to all genres. India by the Nile’s Bollywood element did not stop at the dance workshop and the show, however. In fact, this year the organisers outdid themselves by inviting to Egypt the biggest star in the Mumbai film industry: the one and only Amitabh Bachchan. Often described as the Big B, Bachchan evokes in my mind the significance of the letter “B” in Western classical music, with the well known Three Bs: Bach, Beethoven and Brahms. Though India’s “B” operates in completely different dimensions, I’d risk saying that Bachchan’s status equals the big sum of the importance given by the Western world to the Three Bs taken together. Known to millions of fans in India and across the globe, Bachchan’s appearance anywhere generates instant and extreme frenzy, an agitation that can be compared to the Beatlemania that swept the world in the 1960s. With the Indian population almost worshipping the actor, Egyptian fans (who also number millions) are no less expressive of their love. The acclaimed superstar of the millennium’s career kicked off in the late 1960s, first as a voice narrator and an extra. His breakthrough took place in 1971 with the Indian drama Anand (The Bliss), which paved the way to such films as Zanjeer (Chains, 1973) and Deewar (The Walls, 1975). The angry young man, as his typical character was described by media, Bachchan stepped into the industry just as the Bollywood romance was fading. He made an unprecedented impact in India as well as internationally. In 1982, he suffered a nearly fatal injury on the set of the action comedy Coolie. His hospitalisation was met with nation-wide disbelief, with fans praying in mosques, churches and Hindu temples, offering sacrifices to the saints and erecting shrines to the actor’s name, covering the cities with banners that wished him a speedy recovery. The Big B recovered. However in the following years he decided to take a break from acting and redirected his attention to politics, becoming a member of parliament; together with his wife Jaya he founded Bachchan Corporation Ltd., an initiative that failed financially. These experiences forced him back to his true calling, and he made a comeback in the 2000s. In over four decades of acting, Bachchan has appeared in 150 films, garnering numerous awards as Best Actor. Most recently, he was awarded for his service to the nation with the Padma Vibhushan, the second highest civilian award in India. During his career, Bachchan visited Egypt a few times for movie shoots. This time he was invited by the Embassy of India as the festival’s guest of honour. Bachchan’s visit has been highly promoted by both the Indian Embassy in Egypt and the media in both countries. The Big B also expressed his happiness to visit the cradle of civilisation in his virtual communication with fans. With 20 million followers on Facebook and 14 million on Twitter, at the age of 72 Bachchan is India’s most Internet-active movie star. In Egypt, he is especially popular with the generation who watched his movies in the 1970s and 1980s, when they were screened at the local cinemas, demonstrating the long history of friendship, mutual support and trade connections between India and Egypt, the alliance between Tito-Nasser-Nehru and later the famed Non-Aligned Movement. It was at this time that the Egyptian population developed its love for Bollywood. Today, the distant love story is rekindled and extended to other aspects of Indian culture with each Bollywood film screened. It is not hard to understand this unconditional passion for India’s movies. Mumbai’s stars keep opening the doors to escapism, luring viewers into a world of fantasy, romance, heroic dreams, bravery and thrills, all of which help the population forget its daily worries. Praised in India, understandably Bachchan is also the hero of the large segment of the Egyptian population. On this visit he was greeted very warmly: Cairo’s Academy of Arts granted him its Honorary Doctorate and his fans demonstrated a high level of hysteria on several occasions. The press conference that took place on 31 March morning turned into chaos as screaming journalists crammed in to catch a glimpse of Bachchan, failing to hear – in fact not even trying to listen to – much of what he had to say. However, emotions were better controlled later in the day when at the Cairo Opera Main Hall the star had an interesting discussion about his life and work with the renowned Indian journalist Sidhart Bhatia. The meeting unveiled a man deeply in love with the phenomenon called cinema, humble, grateful for all the wonders that life brought his way, and even appreciative of failure as an important part of the learning process. He mentioned many directors who “helped me become who I am today” and kept thanking the attendees for their love. “After so many decades, you still have the same regard and affection towards me and I thank you very much for that,” he began. He went on to elaborate on the power of Bollywood, pointing out how the question of its popularity keeps returning in all conversations and how as a very young boy he asked his father the same question. Moving between his father’s words and his own analysis, Bachchan explained that Bollywood’s secret lies in its attractive stories which cater to the emotions, speaking of ordinary people’s lives and passions. While people find themselves in the Bollywood characters they also find in them their dreams. “I sit here. I’m almost an alien, I speak a different language. But the language of cinema is very strong and you do not need to know that language to be able to understand what’s going on. Egypt is a wonderful example of that. And despite the fact that I’m practically an alien, you still follow the movies, enjoy the stories, and listen to the music… This is what makes our cultures so close one to the other. “Technically there has also been a lot of improvement and we have access to some of the latest technology,” he said. “Also today, life became fast paced and an exchange of information is very fast. The filmmaking in India has become relevant to that speed. The fact that in India we have now almost 800 television channels allows people to see the products that are all around the world including those coming from the West and those which could be more superior and we immediately want to follow them,” Bachchan added, stressing the factors that trigger constant development of India’s film industry. But even the best rose has its thorns. In the enumeration of superlatives, the Big B did not forget to draw attention to some of the pitfalls of Bollywood. “The sanctity of poetry and the word has been lost a bit on the way,” he noted, hastening to add that the cinema always reflects what is happening in the society at large. With a long career of cinematic achievements and scores of memorable roles, Bachchan looks with optimism to the new generation in the film industry. Whenever he is approached by a young filmmaker, Bachchan added, he feels particularly honoured. As the discussion came to the close, Bachchan stood up and many of the attendees stormed the stage, a few jumping over the Opera’s chairs, to greet the Big B. Bachchan presided over the official opening of India by the Nile at the Pyramids, and on the following days a number of his movies were screened. With Bollywood making a huge impact on the Egyptian audience, until 16 April, India by the Nile will be offering interesting events and artistic experiences targeting different tastes and expectations.